SAVE THE DATE! 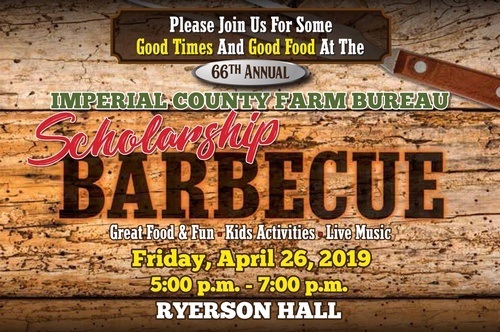 Please join us for some Good Times and Good Fun at the 66th Annual Imperial County Farm Bureau Scholarship Barbecue! Don't miss out on this fun event and great food! All proceeds to towards our scholarship fund, so come out and support our local ag students! For tickets or sponsorship opportunities give us a call at (760) 352-3831.